The view from Gibraltar is one of curiously optimistic doom. A general view of Victoria Stadium, the venue for tonight's Euro 2020 qualifier against Ireland. Optimism rooted in pessimism isn’t solely unique to Ireland. Ireland have twice played Gibraltar since they were granted Uefa-member status in 2014, and have beaten them twice: 4-0 and 7-0. There are some significant differences about this evening’s game, however. The first of those was played in Faro in Portugal, as Gibraltar’s home ground was deemed unsuitable by Uefa. They had to make a series of upgrades to ensure that the 2,300 capacity Victoria Stadium can host tonight’s game, which included an improvement in floodlighting and media facilities. The conditions may also enfeeble Ireland somewhat, and while Mick McCarthy is refusing to make a mountain out of the astroturf pitch, the wind might complicate matters further. The Victoria Stadium is at the foot of the Rock and virtually beside the airport runway and thus has been whipped by gales all week. There are factors beyond the conditions to give Gibraltar some more optimism. As they renew acquaintances with Ireland, they do so having won a competitive game for the first time. Then they went and did it again. Both wins came in the Nations League, the first away to an Armenia side featuring Henrikh Mkhitaryan. That game began in farce as the hosts accidentally played the wrong national anthem, meaning the Gibraltar players lined up to the Liechtenstein anthem. Armenia were then embarrassed in a much more substantial way, as Joseph Chipolina’s 50th-minute penalty sealed for the vistors a historic win. Gibraltar then followed it up with a second win, this time at home but again in a game prefaced by the Liechtenstein anthem, and again thanks to a Chipolina winner. “After the Nations League, some national pride has come back”, testifies Ignacio. We were playing amateur before, and then we went to Uefa, all we were seeing was defeats. We were the whipping boys of Uefa. All of a sudden, football spirit is coming back because of what the national team have been doing. The arrival of Ribas as head coach has also made a significant impact, says Ignacio. Some may remember him as the head coach of the Lincoln Red Imps team that shocked Celtic in the qualifying rounds of the Champions League in 2017, guiding them to a famous 1-0 win at the Victoria Stadium in what was Brendan Rodgers’ first game in charge. “There has been a transformation in the whole way Gibraltar are thinking with the introduction of the new head coach”, says Ignacio. The Red Imps are a local institution and have won all but one of the league titles contested since Mick McCarthy last managed the Irish squad. The part-timers will be well-represented against Ireland and will provide experience, with midfielder Lee Casciaro (36) along with Roy (36) and Joseph (31) Chipolina expected to be involved. All three were part of the win against Celtic. 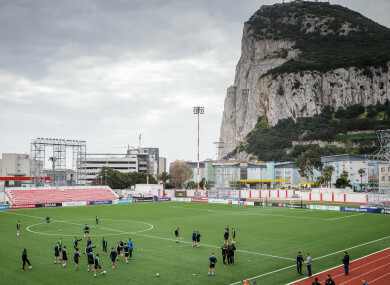 The Gibraltar squad are largely part-timers: Joeseph Chipolina, for example, works as a prison warden while Casciaro works for the Defence Police. 30-year-old Liam Walker is full-time, with Mick McCarthy using his pre-game press conference to flag the quality of his set-piece delivery. There are a number of teenagers involved, too, with 19-year-old Tijay De Barr recently sealing a move to Spanish club Real Oviedo. As you might expect, a Spanish influence is pervading football in Gibraltar, particularly at underage level. The style they are likely to deploy against Ireland, however, will be one redolent of Ireland’s best nights; a doughty and gritty defensive performance, dropping deep to defend their plastic Alamo. Ribas acknowledged Ireland’s quality in his pre-match press conference, and said that the game is an opportunity for Gibraltar to continue their development. If they avoid defeat against Ireland, talk of mere development will turn into chatter of revolution. Email “'Ireland will see how Gibraltar have changed... but we will lose' ”. Feedback on “'Ireland will see how Gibraltar have changed... but we will lose' ”.